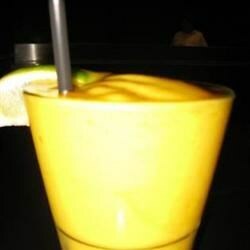 Pour mango nectar, pineapple juice, rum, triple sec, and lime juice into a blender and pulse once or twice to combine. Add ice cubes and blend until drink is slushy and no ice chunks remain, 1 to 2 minutes. Serve in a glass with additional ice if desired. See how to make a refreshingly dry rum daiquiri named for Papa Hemingway. Not much flavor. Probably did too much ice. Will try again without crushed ice and just pour it over ice cubes.